The discussions going on all over the J-blogosphere are nothing short of disheartening, and to that I have little to add that hasn't been said already. One point I would like to make, however, is about the side question of whether or not this is more of a "Modern Orthodox" problem than everybody else. Personally, I agree more with Sephardi Lady than Harry Maryles that it is not just an MO issue, but I do think that there is a large difference in the causes that bring this problem about between the communities. It's almost as if the response people had to kids who were "off-the-derech" was to take things to the other extreme... and in the wrong communities. A decade ago, and continuing on through today, we see teens in yeshivish communities who feel like they have little freedom in the community 'rebelling' and doing all kinds of things, including those detailed in the above pieces. The (IMHO correct) response was pioneered by R' Yaakov Horowitz and others to encourage parents to not pressure their children unfairly [among other ideas] to ensure their happiness and discourage their desire to do a lot of the things they were doing. But for some reason, it seems that parents in Modern Orthodox homes have followed the same ideas... but they should not have. The teens in Modern Orthodox homes are generally not doing drugs/smoking/drinking because they are too pressured, but often because the reverse is true: The rules and standards they are (or are not) held to are simply too loose. Where does a parent get the idea that allowing their teenage son or daughter to go to Miami - unsupervised - is a 'freedom they need'?! That implies to the teen that their parents understand (at least to some extent) what is going on down there, and that they're "okay with it". At this point, I think most of us know the dangers of parents being too harsh, too tight, too controlling, and pressuring their kids too much. But we must also be aware of the problems that exist on the other end - being too loose, too lax, allowing your kids too much 'freedom' without having to answer for what they're doing... with who, and where. Yes, balance is extremely hard and varies from child to child - but I think that it's plainly obvious to any observer that a lot of these parents don't seem to be anywhere close to achieving a proper one. It's time to find a better balance - not getting crazily drunk on Purim is probably not a bad place to start. A nice amount of y'all have recorded themselves for the Purim Podcast - thanks. Some of you are nuts - you know who you are! :) The rest of you? Get to it! Even just a quick "Hi, this is _____ of _______" will do. We've got commercials, jokes, people being funny, everything - keep 'em coming! The deadline is tomorrow at 12:00 EST (unless it changes). NOW Motzei Shabbos! There was a $50 non-refundable application fee which I didn't have, and I couldn't ask my parents for. Five friends gave me $10 each, knowing I wouldn't be able to pay them back (even with uniforms you can tell who has money and who doesn't.) I went to my interview with high hopes. The Rabbi barely spoke to me - I could have told him about my hobbies, my sick brother, my family, my interests but no, he wanted me to read a huge Ramban - cold. I couldn't do it. I tried. I choked. I was not accepted. Read the whole thing... and the comments. For all those of you who have submitted material already for the Purim Podcast that Jameel is compiling, submit more! For those who have not... it can be anything. Just think of something, record it, and send it to Muqata at Gmail.com. Anonymity is guaranteed; voice-scrambling can be done if you wish. "Hi, this is ______ of ______"
and send that over, too. If you'd like to add a second line (say, "and you're listening to Muqata radio/a windbag settler/a crazy nutjob/Purim2007/whatever"), feel free. You can record anything about anything - it doesn't have to be specifically about the J-blogosphere. It can be a skit, a song, a poem, a commercial, Jameel getting slammed over the head with RenReb's purse, making fun of me [as a few people said: That's easy!] ... anything. Too chicken to record something yourself? Leave it in the comments, and we'll see if we can get someone else to do it. J-blogosphere, it is time to show off your creativity! Hey, I'm all for giving kids a little freedom - God knows that they need some, considering the constraints of attending 6 days a week of Yeshiva. But never without proper supervision, never without proper attendance to their safety. Is it easy to strike the right balance? Of course not. But getting it wrong can have dire circumstances. Too much freedom, and they end up on the streets without breaking any rules at all. Too many rules, they end up on the street simply to break them. I'm just so scared, as my kids enter their teenage years, that I won't strike the right balance. Isn't everyone? Heck, I am, and Elianna's not even a year old yet. Check out OM's post. It is recommended that participants be familiar with Rabbi Dr. Soloveitchik's article "Rupture and Reconstruction: The Transformation of Contemporary Orthodoxy," a copy can be found here. For some people, some of the time, being busy is a blessing. To be alone with their thoughts could be torturous. SJ has written a short and fabulous post about a subject that came up over the weekend at SerandEz. She had made an interesting point last night which she summed up beautifully within her post about an added reason why we must try to understand and respect the reasoning even of those with whom we disagree, however much we may dislike too. Check it out. Idealism, and the idealistic, are truly the key to the future - their drive and energy are what spur progress in all its forms. But they can only do so when they understand and can present how to practically implement their ideals in the real world as opposed to the abstract... and the real world has many pitfalls, many of which are not logical - but because they do exist, they cannot be ignored. 8. You take Dead Man's Curve at 60 mph....holding your breath. 12. You actually know how to pronounce Cuyahoga. 16. You're still dumbfounded by the leaping fountain in Tower City. 17. You've never ridden in a taxi. 19. You have no idea how exactly to get to the Flats, you just kind of end up on a bank and start partying. 20. You really don't know what the Warehouse District is, you just know that it's a great place to party. 21. You know who the Jake really is. 27. You know Tower City isn't a city at all. 30. At least half of your wardrobe is Tribe apparel. 31. You know all 4 seasons: winter, still winter, almost winter and road construction. In short, what the deleted material is as follows, he saw many people who had no business becoming teachers taking the job only for the money. He writes that he was a teacher and he would spend a few weeks trying to understand each student what was the best way to deal with him. Another thing he writes is the importantance that boys have a proper understanding of the Hebrew language; not that he has to be a baki in dikduk just to know the basics than it’s easier to learn chumash. Once the boy knows chumash only than should you go on to learn Gemara. When he begins this limud, be careful to go slowly so as not to over burden him. The main point is not to learn enmass, rather emphasis on making sure the student fully understands everything before going further. A hilarious story from Israel, courtesy of Y. Medad - a few seminary girls beating up some yeshiva guys after one guy propositioned one of the girls. And so, as my friends and I passed through our late teens, there was almost no home that was not filled with long, passionate sessions with our parents about TACHLIS, as in - "Vus vet zayn a tachlis mit deer"? (Loosely translated as, "What will become of you?"). Tears were shed on both sides. Mamorei chazal were quoted (mostly on our side) as we pleaded our case to allow just one more year of uninterrupted yeshiva study. And then another year. But at no time during the many discussions was there any thought of presenting no plan at all.They and their son agreed that he would learn full-time for a predetermined time after high school. It is now 6 or 12 months after the 'deadline'. Their son, begging for more time, pleads, "But Ma, I just started really getting into learning." His Rosh Yeshiva echoes the sentiment during discussions with the boy's parents. Coincidence? Of course not! Surely the maturity that comes with the passage of time and an acquired appreciation for the virtual Gan Eden of learning Torah lishma makes the third year generally more productive than the first. There is, however, another factor that makes the last year most productive - the simple fact that it is the last year. Any arbitrary deadline gets your adrenaline running and forces you to crank up your productivity several notches. Google, Inc. is possibly the most fascinating company on the planet. In an information age, they are the source of more information than any other company - and as information shapes people's views, being able to control that information is of utmost importance. Google also has the best and worst of a lot of worlds... it allows every voice to be heard; but that includes the crazies, the crackpots, the bigots, etc. It also ranks - using complex algorithms - the most 'important' views on any given subject... whether or not they happen to be factually correct. Anyway, I've always found it interesting. They're a scarily powerful company. Meanwhile, in other news, Google has basically gotten a ruling that allows Orthomom to defend herself if she so chooses... and she so chooses. All in all, not bad - it does mean that assuming Orthomom can defend herself (which it seems clear she can with ease) Google will not be releasing her information. "Sir, there is a one hour wait. I am programmed to converse with you until a table is ready, if you please." "Sir, what is your IQ?" The robot then proceeded to discuss the theory of relativity, interstellar space travel, the latest medical breakthroughs, etc. The man was most impressed. The next day he returned, but thought he would try a different tack. "What is your IQ, sir?" So the robot started discussing NASCAR racing, the latest basketball scores, and what to expect the Red Sox to do this weekend. "A-r-e y-o-u-r p-e-o-p-l-e g-o-i-n-g t-o n-o-m-i-n-a-t-e H-i-l-l-a-r-y?" ...in both the Jewish Star and by the Five Towns Jewish Times' editor. PSA: Kosher L'Pesach Liquid Toothpaste? My brother-in-law is searching for liquid toothpaste that is kosher for Pesach. He always used one brand (Tryadent? ), but they are no longer kosher for Pesach. So... he's looking for another brand, and can only find one other brand that is good: Gum V Gum or something like that. He can't find it anywhere in Baltimore, and I've never heard of it myself - but he knows a friend definitely had it, and bought it somewhere in New York City. Does anyone know where a person could buy this brand of liquid toothpaste with a Kosher for Passover symbol somewhere on it? Thanks. Now this is what we call short-sighted: John Edwards (D - Presidential candidate) was asked what the greatest threat to world peace was. His answer? According to Bart, Edwards was asked to name the greatest threat to world peace at the moment. Instead of the simple answer, wars, Edwards had to be a smarty jones and say the increasing likelihood of an Israeli attack on Iran was the primary current threat. You know, because then Washington would start bombing somebody, and Syria/Lebanon would get involved, and Russia would start threatening everybody, and it would be a nuclear war, etc. Well, let's start with the stupidity of this - why would Russia et al ever get involved? Why would this be worse than Osirak in 1981, which had more international support and led to... nothing? In the grand scheme of "world peace", the world now looks back on that incident with a huge sense of gratitude towards Israel. The worst that this could likely lead to is a flare-up from Hezbollah/Syria... which really wouldn't happen. As commenters noted at DovBear, the first shot from Syria would lead to the flattening of Damascus; and Hezbollah really isn't up to fighting Israel just a few months after the UN saved them from this past summer, especially in terms of a real large-scale war. Edwards was right. The world isn't going to go up in flames if Al Queda pulls off another attack. It'll be horrible, of course, and a terrible tragedy and all that, but not a threat to world peace. If Iran gets the bomb, we'll all be very nervous, but we won't start shooting at each other -- at least not right away. Huh? Sure, if we don't fight, it's not technically a "war". And World War II didn't really start when Germany took over Poland; it started when the British and everybody else started responding. So a wonderful approach in that instance would have been to just let Germany do as they please - it wouldn't have been a threat to "world peace" per se, and then we could all have talked about how smart we were for not fighting back. Moronic. Pretending that there is no reason for us to be fighting to uphold some fake perception of "world peace" is exactly the problem. The biggest key in that paragraph is "at least not right away". People love to pretend that there are no problems, no reasons to fight. People can't stomach the idea of war - people die, people get hurt, and in large numbers. Over 3,000 US troops have been killed or died in Iraq since March 2003, more than were killed in the attacks on the World Trade Center. This is hard for people to comprehend - why should we fight and lose even more lives than we lost originally... and by our own choosing? Of course, we could look at World War II: 6,000,000 Jews were killed in the Holocaust... but that was nothing compared to the 24,456,000 military deaths [on all sides]. Or the 32,327,100 civilian deaths excluding Jews. The United States lost 462 thousand troops... over what, Pearl Harbor? 2,403 military personnel? The answers to all of the above are obvious. We do not - or should not - wait until threats are too imminent before responding, or we dramatically reduce any chances of success. The longer we take to nip threats in the bud, the more casualties they inflict. Sure, it would be great to stick our fingers in our ears and say "LALALA I can't HEAR you!! ", pretending all the while that nothing is happening around us; but that's not how the world works. Iran is still trying to - and getting closer to - developing a nuclear weapon. North Korea may already have them. Should we ignore Iran until they actually use it? Sure, destroying their nuclear capacity will likely lead to some small-scale regional war - but is it better to wait until a city is wiped off the map? Should we have let Hitler continue taking over small countries in Europe? The United States didn't understand the full impact of Hitler until after the war was over, yet found it to important not to join (even late) to fight against him. With Ahmadinejad, we have a much better picture of what he is all about. When it comes down to it, this is what Edwards should have answered: The true greatest threat to world peace is inaction. The bottom line is that nowadays parental pressure has virtually forced the hands of our educators in large cities to pull in the gangplank of the teivah when ‘average’ kids apply. Why? Because accepting ‘average’ kids is the kiss of death for many schools in the eyes of the ‘customers’; parents of prospective children (that’s you). The caring principals who were once accepting and tolerant regarding admissions policies have had their schools relegated to second-or-third tier status by parents (that’s you, again) who now shun their mosdos. Other school heads and board members who watched this horror show of a school’s decline due-to-word-of-mouth unfold learn the ‘new math’ rather quickly. The equation is quite simple and brutal. More children in these larger cities, b’eh, means more schools in the same geographic area. More schools mean more competition. And which parent wouldn’t turn over heaven and earth to get their child accepted in the ‘best’ schools? It's time for schools to focus on education and teaching middos (and knocking down tuition costs) and stop worrying about reputation (like this post by Harry Maryles). They - and more importantly, the students - would be a lot better off. How Holy Hyrax met his wife. Part 1. It was spring semester of my senior year, 1998. Awsome time. It was a time when we could get out for lunch, hop in my Merkur and go to McDonalds for 29 cent cheeseburger Wednesdays. Mmmmmmm. Can you believe that? 29 cents? You can probably get a packet of ketchup for 29 cents at a kosher joint. Anyways, I was always the shy type. I never had a girlfriend before. When we go to clubs, I would sit out or just jump up and down with the rest of the dorks. Along comes Valentines Day and some synagogue is throwing some party. Party, party party. Soooooooooo, I go with some my friends which consists of 2 Persians, and an Assyrian. “ Ooooh, I finally got a yearbook. Im just going to skim through it looking at all the pretty girls in the school (Hey, everyone did it). OK, let me try out the 9th grade girls. (whistling a fine tune) Hmmmmmm,..... WOW, this girl is really pretty. I wonder if she is Israeli. index finger moves to list of names ..... Wow, shes pretty and Israeli. Oh well. Bunny: Oh my gosh, ya, how you doing? OMG Assyrian? Bunny: Nothing, Im here with my friends. Like, its been so long, I cant believe I bumped in to you. Bunny: (In a cold, toned down voice) hi. Well, she made quite a first impression on us. I look at Persian 2, he looks at me and we both think the same exact thing. and Taz discusses how he became Taz... and how that shaped his education. A really important read - I think a lot of people can relate to many aspects of this (sadly). Meanwhile, the world keeps getting smaller. It's gotten to the point that I feel like everyone is within just 3 degrees of separation from either myself or Serach... and in a few different ways. Take Jameel - we've discovered that we're probably connected in over a dozen ways. (Okay, so admittedly, Jameel is scary.) And granted, both Serach and I are related to a lot of people in different parts of the world... but it's still getting a bit crazy. After a meal once, a headhunter asked Serach if she could hire her... and wasn't kidding. The world is ridiculously small... does anyone out there not know me, Serach, or someone who knows us?! Accountants don't get legal holidays between mid-January and April 30th. We do get a "pizza & jeans" day, though... which meant that I got pizza, since I don't own any jeans (weird, right?). Sarah's mom's surgery went well! It's nice to have AbbaGav back. Do some good at Treppenwitz. SIW notes that sometimes, the journalists are the ones creating the news. Harry discusses objectifying women and mixed seating. DAG notes who the worst people are. Sephardi Lady questions when we should be tipping for mitzvos. I've often wondered about some of these - people get insulted if you do or don't tip, and it's confusing as to when a person should. Shoshana discusses the narrowing of what the Torah wants according to some... and how that seems to ruin the point. DovBear has a related and sad post from a 13-year old: How yeshiva destroyed him. I really enjoyed this post of Irina, talking about the failure of the Marketplace of Ideas. Very intriguing. R' Gil has an excellent (and rare opinion) post on empowering women and separate bussing. A must-read. Finally, read this post by DAG. How can anyone celebrate something that so starkly reminds them of their own loss? There's a lot of stuff up people's sleeves for Purim, it seems... In the meantime, enjoy a little food from Batya with the 15th Kosher Cooking Carnival, and some v'nahapachu from YidWithLid who couldn't do Haveil Havalim. As I'm about to post this, I realize I basically ended up writing a few posts of my own. See, people? I sometimes write posts, not just link to them! We often hear about how we need to look around more, to see where we can help. But sometimes (often?) helping is just being aware of whomever is right in front of us. We need to start looking at people; not past them, not through them. But that's idiotic! What good are the aesthetics if it's ruined on the inside? So he is an idealist cloaked in cynicism. To some extent, I think we all are, the older we get, the more life experience we get. This can be viewed as both a positive and a negative - while we need to be idealistic, we must also be realists; on the other hand, full cynicism (as opposed to tempered cynicism) and pessimism destroy the chances of success. We're all striving to find the correct balance of idealism, optimism, realism, and cynicism... while trying to maintain a sense of positivity. It is not what she is; it is not who she is. She believes that everyone is given challenges and trials, and that God does not give us challenges that we cannot handle. These challenges are meant as stepping-stones; we are meant to grow. She is who she is- happy, having accepted her limitations, optimistic, clever and kind- because of the way she has reacted to her diagnosis and sometimes limited abilities, also because she was given wonderful parents to help her. But she is not her limited abilities. She is not "the deaf girl." RaggedyMom had a good post about labels last week. This is a bit different - while there is a practical usefulness in our own using of labels, that does not mean that people must live by the labels assigned to them. None of us can afford to let our labels define us. We all must try to be the best us we can be, not try and live up or down to the labels others have given us. I am not merely a 'math smarty pants' nor am I merely 'lazy'. I am who I need to be... or I am trying to be. If I am trying to live up to other people's expectations [first millionare] or other people's definitions of what it takes to succeed [cutthroat; not helping others at my own expense] I am living for them or their expectations - not for me. I will not be happy. She can tell good people from "bad" (and I use the word lightly, in order to connote inconsiderate, unkind, or thoughtless as well) simply by seeing how they react to her. If they are overly nice, overly sweet, if they treat her as a chesed project, as a girl to protect from the world- she knows they are not true friends. If they pity her- and have I ever met anyone who needs pity less!- it is to assert their own superiority and look down on her from their high vantage point, not out of kindness. Pity is one of the cruelest traits. We all wish to be treated as would anyone else - this does not mean ignoring our limitations, but being treated decently. Treat people as you would anybody else. A close friend of mine is dyslexic - so when I see an article the friend might like, I'll call and tell them about it rather than forward it to them as I might for another friend. It takes me an extra couple of minutes, perhaps - but I also get to hear their thoughts and discuss it with them much faster than I would via e-mail. Are all situations equal? Of course not - each has its own differences, but in both what you give and what you receive. I want the person to help themselves and I have a hard time understanding, unless someone is truly standing in the way, why they do not. I do not want what is best for the person; I want what I think is best for the person. This is the judgmental personality. Now, when it comes down to it, of course I do not want to make people do things they do not want to do. When it comes down to it, who says my definition of "fixed" is right? As my friend pointed out, people are not toys. You cannot play with them; you cannot make them do things. Nevertheless, this is the way I like things to be- I like them to be fixed. Many have noted that one reason people enjoy blogging and commenting is this very trait - we are, by nature, fixers. We like to fix things, to fix people. And while this may be noble, we must also be careful to fix things as they need to be fixed, as they want to be fixed, and not as we want them to be fixed... and if they do not want fixing, we have to gauge if our attempts will only break them even more. Sometimes, the best way to fix something is to let it grow and learn how to fix itself - we just need to help support it while it grows. I am not a very patient person. ... I become frustrated with people who do not do what I think is the correct or "fixed" path. And anyone who can- any doctors or medical professionals or researchers- I think the world of you. You are my hope, because you are going to change this world. Right now, especially, I could not agree more. Even in sorrow, we all strive to find that silver lining - whether the good that comes out of it, the reactions of others that show people care, the lesson to be learned. If we did not, we would all go insane. I still remember walking in Neve Yaakov, not a sound in the air, on a perfectly clear night, just over four years ago. [Wow, has it really been so long?!] I started thinking through all that had transpired in my life in the previous 6 months - the good, the bad, the worse, the ugly - and how it all fit together. There were so many little things - negative things, sad occurences - and yet so much of it was working to prepare me for the future. Now, four years later, I look back on those 3 hours of pacing up and down the concrete hill, watching the flares being dropped silently on a village in search of a terrorist while I straightened out my own thoughts, and I am happy to see how all those bad stories turned out to have such amazing outcomes, outcomes I would never have dreamed of. Life is amazing. if this doesn't give you hope, if this doesn't inspire you, I don't know what can. DaKirsch sent this one in... so many best lines to pick from, I don't know where to start. Ezzie: This post has been dedicated to Toast and Bearded Man, who suffered a tragic loss two weeks ago today. I almost felt bad for you guys, until I remembered that I'm a Browns' fan. DAG, count this for you, too. Updated: The embed property doesn't seem to work properly, so just click here. "I sure hope for Ms. Greenbaum's sake that she's not ugly!" But more important is the idea that someone could even be sued for the actions and statements of their commenters. If that were possible, we can kiss goodbye to a lot of blogs. Seriously - imagine if DovBear were legally liable for the comments people make on his blog!? Or Canonist? They'd be bankrupt in a week. The whole blogworld could get sued! Think about it in an even broader sense: Many political, news, or sports sites allow people to create their own blogs or comment on articles online. Can Barry Bonds sue Major League Baseball for all the MLBlogs that discuss his [as yet unproven] steroid use? Can he sue CBSSportsline, which has message boards? Can people sue Kos for some of the diarists' posts? The answer is simple: The reason we don't see lawsuits against blogs like this? They have no chance of winning. They attract far more attention to the original statements than the blogger ever could have if they'd tried. For someone to try a lawsuit like this, they have to be incredibly dum stup gutsy though ill-advised. I still think this would make more sense if it were a Purim prank. Happy Rosh Chodesh Adar, everybody! ATLANTA (AP) - Government scientists struggled Thursday to pinpoint the source of the first U.S. salmonella outbreak linked to peanut butter, the kid favorite packed into millions of lunchboxes every day. Nearly 300 people in 39 states have fallen ill since August, and federal health investigators said they strongly suspect Peter Pan peanut butter and certain batches of Wal-Mart's Great Value house brand - both manufactured by ConAgra Foods Inc. Shoppers across the country were warned to throw out jars with a product code on the lid beginning with "2111," which denotes the plant where it was made. How the dangerous germ got into the peanut butter was a mystery. But because peanuts are usually heated to high, germ-killing temperatures during the manufacturing process, government and industry officials said the contamination may have been caused by dirty jars or equipment. Board Member Sues Google Over Orthomom? UPDATE: Orthomom weighs in herself. Pamela Greenbaum, who serves on the Nassau town’s board of education, filed papers against Google over nasty comments posted about her on the Orthomom blog. I'm pretty sure that Orthomom won't be getting worried anytime soon, for obvious reasons. As SIW noted, it was anonymous commenters who made the comments, and honestly - it wouldn't make a difference WHO said it. She was called "ugly", "a bigot" (for being against the Orthodox community), and accused of not wanting to protect children (for being against the screening of child abusers). The horrors. I read a short piece today regarding your lawsuit against Google regarding comments made about you on an individual blog. I'm sorry to inform you, since you seem to be unaware of this fact, but such is the rhetoric of politics, right or wrong, stupid or not. But to sue Google over the anonymous comments of other individuals on an anonymous blog for making obviously hateful comments that only a small number of people may have seen? That's... well, that's just stupid. Here's a basic lesson in Blogging 101: That SiteMeter you noticed at the bottom that shows over 300,000 hits to Orthomom's blog? Guess what - they were NOT all on that one post. Orthomom has a great blog, but those 300K were accumulated over a long period of time... and just a tiny fraction were on that particular post, and some of them by [gasp] the same people repeatedly. A good estimate would be that maybe a couple of hundred people saw those comments, and almost none were influenced by them. But do you know who DOES have a wider readership [somehow]? The NY Daily News. And now, your sad lawsuit which will be laughed out of court will be mocked by possibly tens of thousands in your area... instead of by a select few on a blog. Brilliant, Ms. Greenbaum. I'm sure those who voted you onto the school board are proud that such a forward-thinking individual is their representative. Maybe the lawsuit is just Purim shtick? ...I have found that the symptoms that a child exhibits sometimes mirror what is transpiring in his/her family. Thus, your son’s temper tantrum or meltdown may be a sign that your family is going through a meltdown of sorts. Having a few young children, especially close in age to each other, can be and usually is a great deal of nachas. It is also very, very stressful. Perhaps you should consider changing routines in your lifestyle. Attending less simchos (s’machot, whatever), going out with your husband alone one evening a week when the kids are sleeping, having your husband get more hands-on with raising the kids, even having him change his night seder to a morning shiur, all of these should be explored. And, I don’t know a more delicate way to say this, but if you are feeling very overwhelmed with the raising of your children, please, please set an appointment for you and he to meet with your Rav as soon as possible to discuss your family’s situation and seek his eitzah and psak (click here) as for what is right for you at this time in your lives. A couple had had a number of children in just a few years, and the wife felt like a shmatta (rag). She told her husband she wanted to go on birth control, but the husband responded, "I don't know if there is such a heter (permission), to go on birth control." She pushed, and he insisted on asking only R' Elyashiv in Israel. [They did not have a rav to ask.] They raised money from friends, and they flew and were able to arrange a meeting with R' Elyashiv. He explained the situation to R' Elyashiv, finishing by saying "but I don't know if there is such a heter." R' Elyashiv turned to him and responded, "Who gave you a heter to have 4 kids in 5 years!?" People need to be extremely cognizant of what they can and cannot (and perhaps should or should not) handle, and be willing to ask others for guidance, especially about such serious matters. There are those for whom having 8 children in 10-12 years works just fine; but for most people, this is not the case. Do not assume that you are "supposed" to do so or are obligated to - seek the guidance of a person who understands both you [and your spouse] and the subject at hand. * SerandEz is not a place to get piskei halacha [rulings in Jewish law] from. Please ask your local rabbi, or find someone who can direct you to a rav who is more knowledgeable about the subject. Thank you. Wow - the Cavs were robbed last night. I think that this past week is the beginning of a turnaround for the Cavs - starting to run, Lebron playing harder, other people contributing, Pavlovic finally emerging (and how! ), Gibson taking over at point, and they've finally gotten sick of playing like garbage. It's great timing, too - just as the playoff stretch run is beginning. My own two cents: Is an attack considered a "terror attack" if it is carried out by one person acting alone, not under a terrorist organization? Assuming it is, how would a nation combat such a string of terror? While [I believe] it is near impossible to stop a single madman acting alone before an attack, if there is an obvious pattern (in this case, devout Muslims), what should be done to attempt to stop such attacks? A Simple Jew has a great post on friendship, most of which I agreed with wholeheartedly. I added my own comments, and I'm curious what people think - what do you think makes someone a friend, in particular that extremely close friend? How many people would you consider that type of friend? Is it 0, 1, 2-3, a few, a lot...? Does that change as you pass through life? ....While it's true old friendships were helped a lot by proximity and circumstance, that does not mean they weren't your closest friends. It's only that time and space have slowly broken those bonds away... but if you would see them now, would you not immediately be extremely close with them again? I've been fortunate to go to college and then live right near the same yeshiva most of my good high school friends now attend, keeping those friendships strong and intact. At the same time, there is definitely a difference in the relationship I have with some of them versus the others. A few of my best friends live scattered throughout the world - I almost never speak to them, let alone see them, but whenever we speak, it is as if we've been roommates and/or together the whole time. I think that perhaps those are the closest friends - the ones who would come rushing to my aid (or I to theirs) if the need arose, even if we haven't spoken in a year. Purim 5767: Are YOU Ready? ...The day I have a life again. 10, 9, 8: RafiG has the latest video from my alma mater's choir; LoR has a really good video - "Shine" - from another frum band called Ta Shma; and Pearl has a beautiful song by Amy Sky entitled Ordinary Miracles. I can definitely relate to those...! 7, 6, 5: I think Stern girls are crazy. Check out the different (hilarious!) stories from Fudge, SJ, & Chana. 4) SephardiLady is back with an Orthonomic roundup. Good stuff - as usual. 3) JacobDaJew has a great post (also in SL's roundup) about education squeezing the middle class (and everyone else). Read A Robin Hood Affair. STOP telling kids how smart they are. It makes them lazy. 1) Finally, RenReb is always great for laughs, and this is a triple dose: Three conversations. 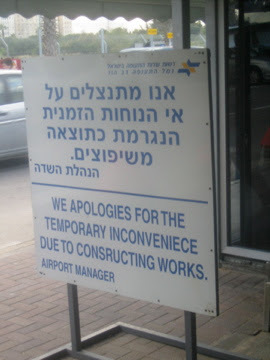 And no, I'm not the airport manager. ...and watch this. (Hat tip: Mara S.) WOW. His speaking out poses more of a threat to AQ and the insurgents than anything we can throw at them. I pray God protects him and that other moderate Muslim Clerics follow his lead. This video is simply amazing. Why isn’t this broadcast on America’s national news? It could turn a lot of heads and change a lot of viewpoints. The cleric is not just from the region, but an Iraqi. His name is Iyad Jamal al-Din of Iyad Allawi’s party. Reading & Writing; Elianna's New "Tricks"
No, no - Elianna isn't the one reading and writing... yet. But in the past two weeks, she's picked up on talking, calling for us (Dada and Nana or Rara, neither of which are Ima, but too bad on Serach), reaching out for us (i.e. becoming clingy), crawling, clapping, waving, sitting (well, sitting better, anyway), eating on her own (a bit), and now... even more! Yesterday, our babysitter called Serach to tell her what happened: She had said, just for the sake of it, "Elianna, tni li neshikah! [give me a kiss!]" Elianna turned to her, closed her mouth, and gave her a "kiss". Now she's giving them all the time. Not only can she kiss, but she's understanding the ivrit we're [sometimes] speaking, too. What's funny is she waves anytime anyone says "Hi" or "Bye"... or anything that ends with an "I" sound. At the same time, she claps anytime someone says "Yay" or if she thinks she's supposed to for some reason. Read Rivka's last few posts. Yesterday I saw this great post by Jameel, and even sent it to others, but I didn't have time to link it. If you know people at Columbia/Barnard especially... read this. For all the women out there, you may enjoy Canonist's new sub-blog, Jewess, which is being written by a number of women (including Orthomom). Everyone is old. Especially me. It's called busy season for a reason. Ugh. Our landlord is - overall - not bad. We definitely have what to complain about, starting from the not having a kitchen for 6 weeks in the beginning to our continued wait for a new refrigerator now - but we've generally worked out some type of deal to compensate us. We've had a few weird stories, including a strange one over Sukkos. Serach stayed in Baltimore the whole week, while I drove back for work. One morning, as I was taking a shower, I hear someone calling my name - from inside the apartment. My landlord had not only let himself in, he was walking around calling my name. I called out from the bathroom (somewhat annoyed) - and suddenly he opens the bathroom door! (Thank God for shower curtains!) He starts having a whole conversation with me... ugh. Awkward, right? Anyways... as annoyed as we are that he used to let himself in like that (he's stopped - calling first and waiting for us to open up), he's really not bad - and nothing like Balaboosteh's. That would drive me nuts. Part of my epiphany came the other day, when I was reading a piece by Ezzie about Joe Biden's comments about blacks. Halfway through the piece, I realized, with all due respect to Ezzie, I am wasting my time. If I want to know more about the incident, let me see what experts like George Will or Bob Novak have to say on the matter. Why should I waste my time listening to a 24-year old accountant [Ez: I'm 23], whose knowledge of racial issues is probably minimal compared to that of the Washington pundits and insiders? Anyways, you covered a lot of my objections in your Part I, which I didn't read until now: Many blogs are of different niches or types, and therefore will last regardless. In fact, I'd guess that most blogs fall into that category (specifically personal blogs). You're really only discussing blogs that are pontificating about popular subjects - sports, politics, and the like. Why should anyone read those when they can read (as you say) the George Wills of the world? And you're right... except why would they do so now, either? For different people, it could be different things: Maybe they don't like the columnists they normally read; maybe they want to see other opinions; maybe they think that bloggers give a more "average Joe" outlook; etc. Also, most bloggers aren't writing for their audience, but for themselves. I'm sure I'm more encouraged to write, knowing I have readers, but I enjoy the writing regardless. Plus, how do people like Will get to where they are? In the old days, you had to work your way up the journalistic ladder, perhaps have some good connections, etc. - in addition to having skill. With blogging, you can move up with a little less of most of that except the skill. I read a large number of blogs on a regular basis (about 150 - thank God for feeds... and yes, I do have a life :) ). Those blogs 'earned' their way onto my feeds by different means, whether by making insightful comments, by me knowing them somehow, or by having a great blog. Even among those blogs, I have my "favorite" blogs - the ones who write particularly well, who are funny or insightful, or who make excellent points in their pieces. Often, those pieces may be better than ones of people like Will or Mortimer Zuckerman or other journalists who I may even enjoy a lot - sometimes simply because they're approaching it in a different way. People develop their favorite writers among news magazines and newspapers; the same applies to bloggers. There's *usually* a reason certain blogs have larger readerships (say, the Volokh Conspiracy) - they consistently put out better material. Finally, blogs are a place where people who may otherwise not be heard finally can be - even if by just a few others. A couple of bloggers ran interesting polls - "what personality type are you?" Almost all (I was of the rare exception) were incredible introverts. Blogs are a place for them to express their opinion, because they're too shy/scared/uncomfortable/don't care to say them in public in real life. In the end, I think we agree a bit, actually: Most blogs will never "make it big" - but most bloggers really don't care to. Bloggers blog because they enjoy it, and when they stop enjoying it, they'll probably quit. Blogging may hit a peak, and may slow... but it isn't dying anytime soon. There's a lot more over there, so feel free to check it out and add your own thoughts on the subject. No, not a roundup... though after a long week at work, it was nice to finally catch up on all the blogs I read! I've just always been a sucker for card tricks. Some pictures are just too funny... and terrorists just shouldn't wear togas. I think about this a lot. I have obligations here, responsibilities I couldn't take care of in Israel. But people always have responsibilities, don't they? Will I ever feel as at home here as I did in my brief time in Israel? Will I-as a Jew-ever have the same opportunities here that I would there, if only because I feel like more possibilities are open to me, that what I maybe could do would matter so much more there? That Israel is still a place where things happen, and you don't just watch them on tv? I think about these things and I want to go. But I don't. Because I have obligations, responsibilities here. Because I'm used to inaction and frustration. Because it's too easy not to go. Here we will be refuting the accusations and exposing the lies that are being told on the streets and in cyberspace about Israel, Jews and pro-Israel organizations. A severe campaign of disinformation is underfoot that relies on anti-Semitic stereotypes, intimidation, half-truths, and outright lies. These campaigns have gone almost completely unanswered. Until now, they have also gotten little press and were deemed by many to be inconsequential. Given the media blitz that has surrounded Jimmy Carter's book, the Mearshimer-Walt paper, and the coordinated media campaign accusing "Jews," and/or "Zionists" or suppressing free speech and access to the media, we decided it is time to fight back. Welcome to the next stage of the struggle. May they have much success. I was thinking that if 100 Rabbis [sic], or however many it is can get together and decide that a simple piece of clothing material should be assur then what would happen if these same Rabbis [sic] actually used this power for other things plaguing our communities worldwide. I guess that's the question isn't it. What if ... ? With its blood-red walls and black leather sofas, Kirkland's Terra Bite Lounge looks like any other coffee shop — until you get to the menu. There are no prices listed. Terra Bite doesn't have them. You read that right: No prices. Customers pay what and when they like, or not at all — it makes no difference to the cafe employees, who are instructed not to peek when people put money in the metal lock box. I went down to Terra Bite randomly on a Sunday with my best friend because Janis had told me about it. Katie and I had this plan to just go in, get coffee and not pay because we wanted to see how it felt to just not pay. We ended up feeling so guilty that we drove back paid double what we would have and I offered to put a bumper sticker on my car to help advertise...it's a crazy mind game they have going there. My initial excitement was later tempered by the thought that we've done this before and it has failed miserably (pick any communist state that has tried to force economic equality by spreading wealth). But then I realized that this was fundamentally different. It's not a government forcing us to distribute wealth. It's about relative worth measured by US. It forces US to look at the larger economic picture and assess how we fit in. It's really brilliant, and I'd love to see how it goes. Hopefully it will show that people really are kind, honest, and fair. My guess? A high enough percentage of people really are, and that will make this be at least moderately successful. Animals are not for us to eat, wear, or experiment on. Now, while I may personally disagree, I can respect those who make a personal choice not to eat animals or not to wear animals. But I can't respect those who feel that we cannot experiment on them, either. Anyone with any medical understanding whatsoever can tell you the importance of animal testing in learning how medicines and treatments can work for people. Just this past Friday night, our friend Moshe was discussing how testing on mice in his cancer research lab was teaching them quite a bit. Noble ideals do not always translate into noble results. Issues are almost never black and white - nobody is in favor of 'cruelty to animals', for example, it's a question of what is truly cruel and how much value we place on people as opposed to animals. I cannot respect those who place the lives of animals over those of humans, however. (Hattip: Chana F) It seems a few girls made their own music video to Lecha, spoofing some parts of the one by David Lavon and company from last year, and now it's up on YouTube. 1) More and more people are starting to realize just how biased ex-President Carter's book about Israel was. His fighting with the well-respected Wiesenthal Center is not helping him. 2) Iran's anti-Semitic cartoons are getting international press. It's about time. Awareness of an issue is key to fighting it. Hopefully, this will make more people aware. Sometimes I wish I lived in Israel. I know it's the wrong thing for me but I still wish it sometimes. When do I wish it? When northern Israel is getting Katushaed and Israel decides to do something about it. That makes me want to be there. Where the action is. But there is a distinct feeling during these tense times that Jewish History happens in Israel. Not only "during these tense times" but I'd say "on the whole" this is where it's happening. I feel hard pressed to say that the future of Am Yisroel is happening in NY. I feel NY and American Jewry will be a parsha in the story of Am yisroel in Golus. Like Poland and Spain and Morocco. At the same time, I know that at the present moment it is best for me to be here (heck, even in New York City), and not there. Then again, I feel that YS is right - in the grand scheme of things, what goes on here is but a small parsha (chapter) in terms of Judaism, while what happens there will not be. I'm not sure any of these really contradict one another, but they trouble me nonetheless. Any thoughts? I hate to lie to my children. But sometimes there is no other choice. "I will miss them so much, Mommy. But if it's better for them to be out there, then I guess we need to let them go. I don't want Joe to die," she said, chin quivering. We said a prayer to G-d to watch over them. She told them she loved them. And then we went outside and I let her spoon them out under a bush in our backyard. Jameel has a wonderful post this morning explaining his decision to raise a family in what many would consider a dangerous area in the Shomron, in response to a question a commenter posed. Check it out. A few notes on my part: Blogger II stinks. Half the blogs don't seem to take comments these days, I lost a really well-researched post I was writing, and I can't take advantage of some of the "new features" without losing a nice chunk of what I've got. Rex Grossman stinks. The interceptions he threw were clear picks the second he let go, as the Bears fans next to me screamed "NO!" when each one fluttered HIGH into the air, hanging up there long enough for any high-school safety or corner to get under. I think the second one was being clocked for hang time. And the fumbled snap was right in his hands - I know the ball is wet, but come on... it went right through, it didn't slide off. 9) This is a great reminder of why I love IsraellyCool. Hehe. 8) Ayelet has love for geeks. 7) SaraK links to a really well-made video (if you like Grey's Anatomy). 6) This post by Treppenwitz about his new glasses which are helping with dyslexia is fascinating. We know quite a number of people with it, and [full disclosure] my sister-in-law is an optometrist in the NY/NJ area and recently opened a vision therapy center that does this type of work. 5) Yaakov Astor runs into some anti-Semitism in The Jews Are Taking Over at BeyondBT. 3) Chana writes perhaps better than ever in discussing The Lonely Man of Faith about Rav Soloveitchik. 2) Raggedy Mom has a beautiful post about bedtime at the Raggedys. 1) Fascinatingly honest post by LabRab on what his PostSecret card would be. XGH on what life is all about. It's a good one. Shoshana discusses whether all Jews should be Orthodox, responding to JA. So lately I have been giving serious thought to quiting the blog scene. I was looking for my own "pot of gold at the end of the rainbow" only to realize, its just an illusion. I don't see a point in continuing. Frankly, the blogs have harmed my life much more than I thought. Everything from shalom bayit to my relationship with mere acquaintances has been affected by the blogs. I think the only logical thing to do is to stop. The New York Times says it better than I did last week. This was a great article. Colts 38, Bears 20. Okay - not really, but I have 8/0 in one of my pool "boxes". My OD brother and sister-in-law (SIL, who writes on this blog every few months) have given birth to a baby girl!! MAZEL TOV!! She's 8 pounds and 18.5 inches, and they're not sure who she looks like yet - but with her fat cheeks, my brother said "maybe Elianna...!" Anyways, we're very excited, and this could yet be an even more exciting Shabbos, if we get to take care of Ben (4) & Hen (2). DryBones has posted one of his old comic strips for Tu B'Shvat, and I really like it: He also has a new one today, and links to another oldie but goodie there - check it out. Ezzie's Blog Roundup: Groundhog's Day! Today is Groundhog's Day, which is easily the stupidest American holiday of the year - and therefore the most fun. What true American doesn't love speculating about meaningless outcomes to meaningless things!? I know I love it. Me-Ander has a couple beautiful pics of winter mornings in Israel. A Simple Jew is ready for Shabbos Shira. Jake's line on Bush yesterday was really good. Ayelet's son is hilariously pragmatic. DaBoys expound on cereal (and milk). If you're not reading this blog yet... this is the best blog you're not reading yet. Steg's little friends know why we can't see God. FrumWithQ's discusses in short the problems with parents being in denial. Serach sees this all the time in her job - it's time we tried to grow up and accept that people aren't perfect. If not for us, for our children! Shifra is saddened that kids of today can't play as we did in the past. This post is right on the mark, and Shifra is another blog you should definitely be reading. LabRab has a very well-written post explaining why he will not be attending the video on the Rav this weekend - he's got Rav burnout. DaBoys explain why football is the greatest sport (as if we didn't know), and drop a nice group of links on us. Kefirot notes just how anti-Israel Chirac is. Sephardi Lady has an amazing yet sad post on waste. Please read it! That's all for this morning/night. Have a great one! UPDATED: I realized after many hours that the end of this post was cut off - it actually disappeared. I'm writing a different ending, since I can't remember everything I wrote, and also to simply write it better. The first mainstream African-American who is articulate? Bright? Clean!? What exactly did he expect - a mumbling, stupid, dirty man? To me, an example like this shows a worse kind of racism than even simple dislike. A person who hates black people simply because they're black is a hateful jerk. A person who - in passive conversation - can show that he expects black people to be mumbling, dirty, and stupid? That's outright disgusting and ignorant. Interestingly enough, the person who made the comment is himself a Presidential candidate: Senator Joe Biden - the Democrat from Delaware. I've always felt that this implicit racism was far worse than any other. We have laws protecting people from being discriminated against, and the simple, hateful racism is easier to prosecute. But implicit racism? It can silently destroy people. For example, look at affirmative action: It forced universities and companies to accept (say) black people - not because they were necessarily qualified, but because they were black. It was a nice way of saying, "Hey, we don't think you could actually earn a job here, so we're going to give you one to encourage 'diversity'." How does this encourage diversity? By putting someone into a situation where they're guaranteed to fail, when they couldn't have earned the job with their own skill? And when they could have earned it, we wouldn't need affirmative action [at this point in history]. Almost more interestingly, though, is in certain areas: New York City, for example. Certain areas in other cities (parts of Cleveland, etc.). Generally, urban areas - ones which contain a high percentage of people who vote Democrat. A brilliant Democrat blogger [not sure if he doesn't want this quoted as being him] I know once agreed with this assessment and noted that where he lives in the Bronx (one of the highest Kerry-voting areas in 2004 in the country) he's heard more racism than anywhere else, much to his surprise. Democrats - who often make a big fuss over race issues - seem to be more racist than Republicans. While Republicans have their Pat Buchanans, their other crazies... those people are not in the mainstream; they are clear fringe players. But the racist Democrats don't even seem to acknowledge or realize that what they believe is completely racist - worse even than those they [properly] mock. Notice the breakdown of most communities in New York: They are broken down by ethnicity and class. In what is supposed to be the melting pot of culture, you have "black" areas, "Chinese" areas, "Hispanic" areas... The way many of the 'liberal elite' seem to view minorities here is to 'throw money at them to help them build their communities' - as long as they don't come into ours. This also helps protect true 'old boys' networks, as connections are only made with people of the same ethnicity. Manhattan has a high degree of income disparity, with extreme wealth and pockets of poverty. Los Angeles actually does list a few neighborhoods when it does the same, noting places such as Leimart Park (91.7% black). Senator Biden's remarks only demonstrate what seems to be a natural belief among higher-ranking Democrats, or some Democrats in general: Minorities need our help, because they can't do it themselves. An interesting statistic, if I'm recalling correctly: There is but one black Democratic Senator, while there are two Republican Senators. 1/51 = less than 2%; 2/49 = more than 4+%. While this is a terribly small sample, it's interesting to compare it to the makeup of the two parties as a whole. About 2% of those who voted for Bush in 2004 were black; having 2 Senators is slightly more than representative. About 17% of those who voted for Kerry were black [and as a percentage of the Democratic constituency in general, blacks are even higher, as only a low percentage vote] - having just 1 Senator (instead of 8-9) seems to be a terribly unfair rate of representation. We also see a real lack of minorities at the top of the Democratic Party, with the biggest black names in the party (before Obama) being people like Jesse Jackson, Al Sharpton, and even Charlie Rangel. Implicit racism is worse than blatant racism in that it pushes minorities down even as it claims to be raising them up. Even as the liberal elite helps out black communities, it holds them away from truly meshing with the communities around them, encouraging black-only cultural stereotypes. The Congressional Black Caucus [solely made up of Democrats] does not allow any non-blacks to join; last year, a House Democrat wished to do so to better help his mostly black constituency, but was rejected [hat tip: BOTW, which made me wish I'd read all my e-mail before writing this piece]. Some liberals encourage calling those blacks who don't follow typical black stereotypes (such as being a Democrat) "Uncle Toms" or "Oreos". Possibly the worst part of implicit racism among Democratic leadership is that these people make their political decisions based on their own bigoted views. These decisions negatively impact not only the very same people they are meant to help, they negatively impact everyone else who is affected by them indirectly (such as qualified white people who lose out on jobs or university slots). The time has come to fight this implicit racism as well, and the best way of doing so is by voting out or calling for the resignation of those who practice it. I can't remember how the rest of this post originally went. It was really good, too. Argh. Blogger Beta stinks.